Obituary – Piel, Anna Pauline (Kukuk) « Perry High School Alumni Association, Inc.
﻿Ann (Mrs. Martin) Piel died at 3:30 p.m. Friday, October 20, 2000 at Perry Memorial Hospital at age 92. 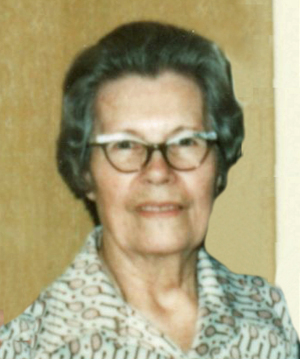 Born Anna Pauline Kukuk on May 10, 1908, at Perry, Oklahoma, she was the first daughter of Fred Carl Kukuk and his wife, the former Anna Margaret (Gerke). 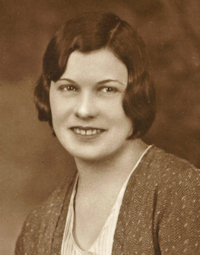 She attended Whipple and Christ Lutheran School and graduated from Perry High School in 1928. On December 23, 1928, she and Martin Frederick Piel were married in Perry, Oklahoma. Her husband preceded her in death. Mrs. Piel was employed as a sales clerk at The Famous and Zorba’s department stores and as a checker and food clerk for Safeway Company. A lifelong member of Christ Lutheran Church, she also was a member of the Lutheran Women’s Missionary League and member and officer of the Whipple Ladies Aid. Funeral will be at 1:00 p.m. Wednesday, October 25, 2000 at Christ Lutheran Church. Rev. Myron C. Maltz will officiate. Burial will be in Grace Hill Cemetery. Memorials may be made to Christ Lutheran Church. Survivors are two sons and daughters-in-law, Kenneth and Barbara Piel, Springfield, Massachusetts, and Allen and Carrol Piel of Perry, Oklahoma, currently employed by Ditch Witch Far East in Taiching, Taiwan; three grandsons, Marty Piel, Perry, Oklahoma, Loren Piel, Las Vegas, Nevada, and James Piel, Dallas, Texas; two granddaughters, Patricia Wilcox, Tulsa, Oklahoma, and Shirley Piel-Stricker, Tucson, Arizona; three great- – granddaughters, April Carlson, Shiloah Piel and Mallory Piel, all of Perry, Oklahoma; five great-grandsons, John Curtis, Eagle Point, Oregon, Shane Piel and Justin Piel, Dallas, Texas, and Hayden Piel and Garrett Piel, Las Vegas, Nevada; two sisters, Alva Leonard, Dallas, Texas, and Lela Buffington, Perry, Oklahoma; three sisters-in-law, Vera (Mrs. Carl) Kukuk and Anna (Mrs. Raymond) Kukuk, both of Perry, Oklahoma, and Edna (Mrs. Ernest) Kukuk, Dover, Ohio; and numerous nieces and nephews. Her husband, parents, three half-brothers, one-half sister, two brothers and one sister preceded in death.